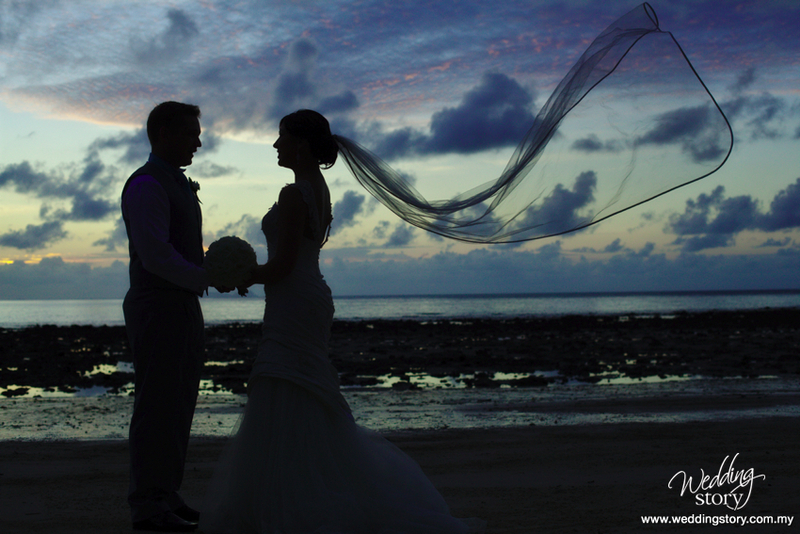 After the short and sweet ceremony, we took some portraits on the beach. Having sunset shots are great, but timing is so crucial! We only had about 15-20 minutes of light before it quickly faded away. I love umbrellas. 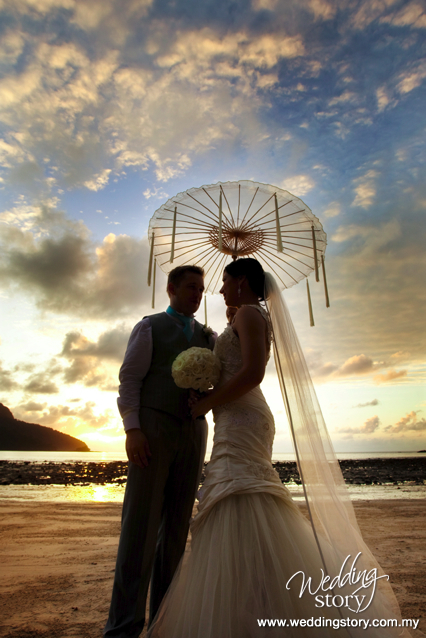 I can now safely say that I have a collection of wedding + umbrella photos. Oh, and I also love veils, especially long ones. 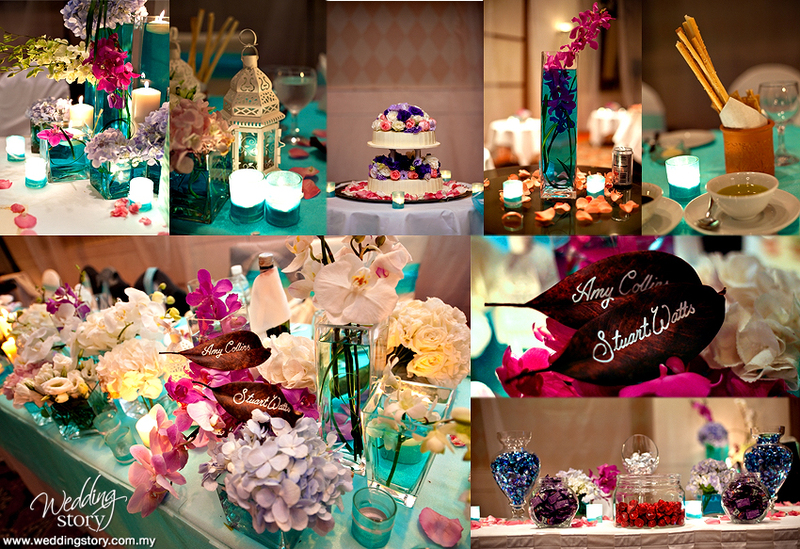 I love the blue theme for the wedding deco, and how it’s so tastefully done! Absolutely love the leaves with the names written on it. Other plus points: Yummy chocs in jars, ready for guests to pick! What I love are these framed photos of Amy and Stu’s parents when they got married! What a nostalgic touch! 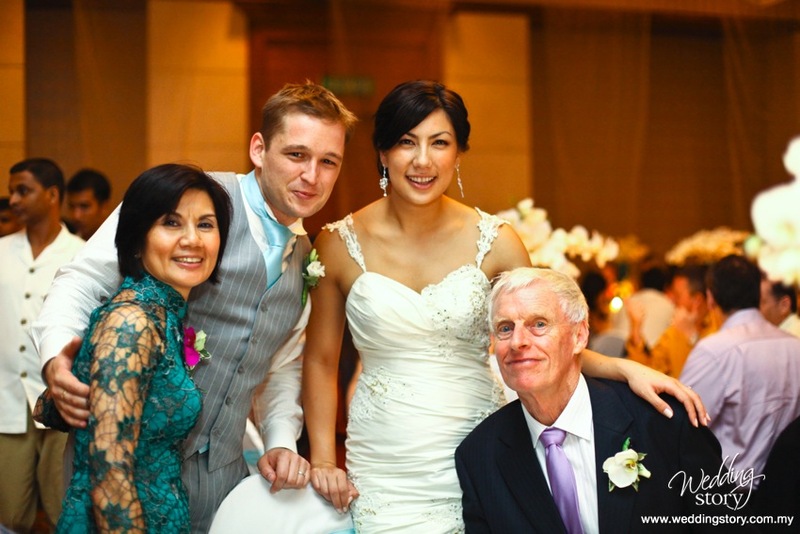 Friends from all over the world flew over to Langkawi for the wedding, mostly from Australia, Vietnam and Japan. It was a really multicultural event. 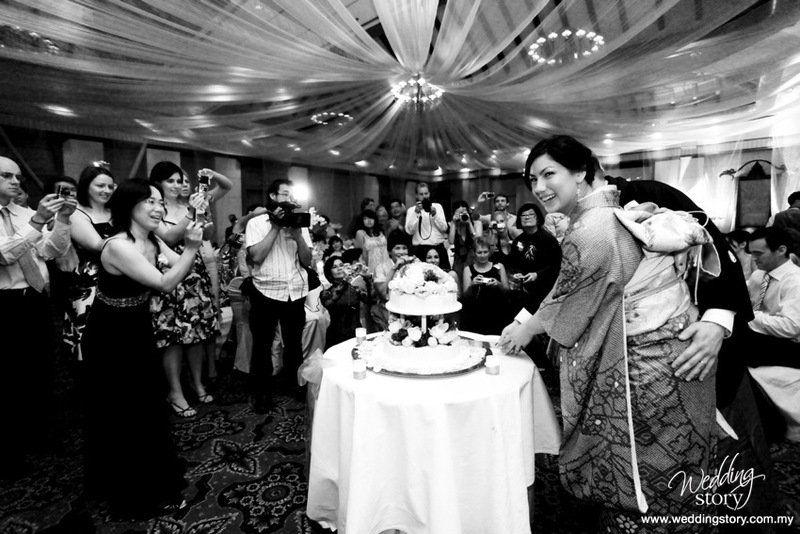 Since Amy had lived in Japan for a number of years, her Japanese ‘family’ flew over to attend the wedding. 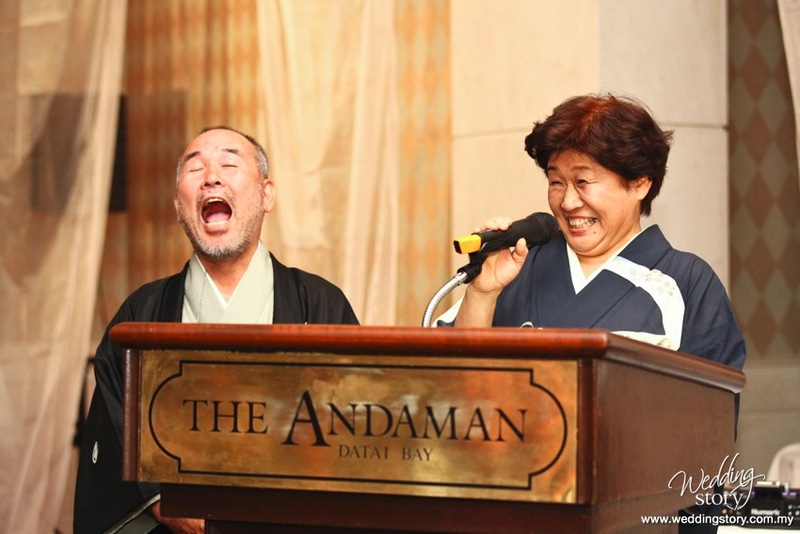 This speech was done entirely in Japanese. Stu can understand and speak Japanese too! 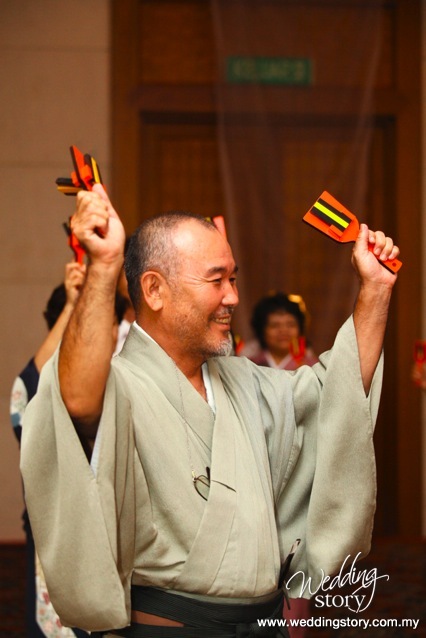 There was an even a special Japanese performance that night. Look at how many people we had to fight with for the cake shot. 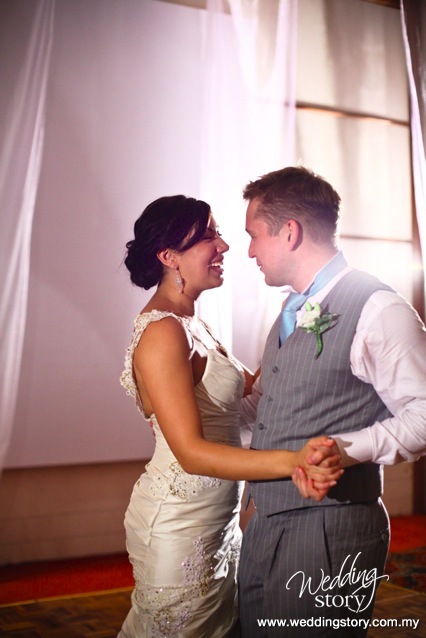 Amy and Stu’s first dance. 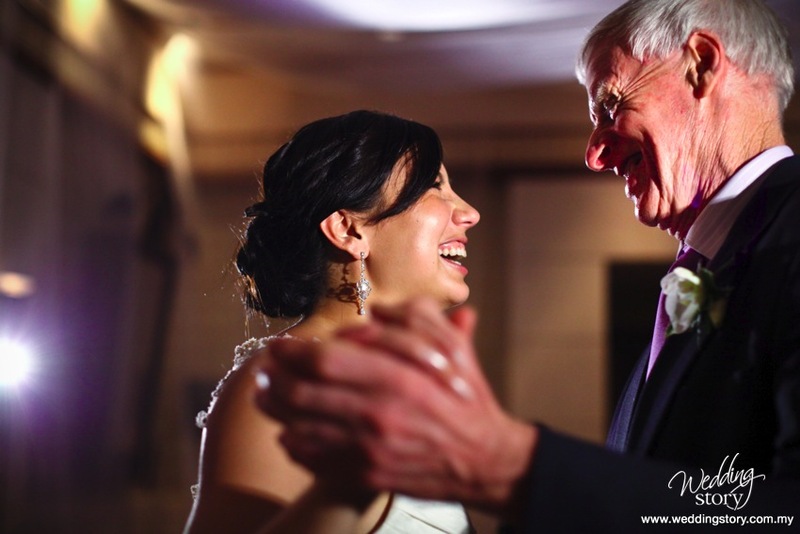 And another lovely father-daughter moment. Bloom workshops is here! Check us out! 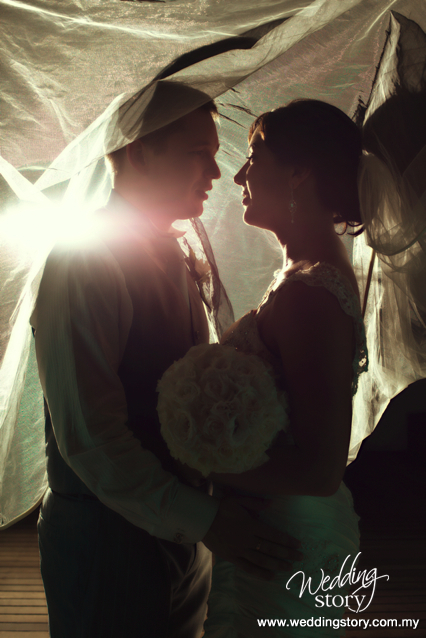 So loved the umbrella shot… n the veil shot too…. nice nice!! Thank you so much. The photos are fantastic! I can’t stop looking at them and re-living the day. You captured so many wonderful moments with our family and friends. Thanks to you and all your team for helping us keep those memories forever. Ps. the umbrella and veil shots might be my favourites but its so hard to choose! Amy! Glad you like the photos. Mark took some of these really beautiful shots too. 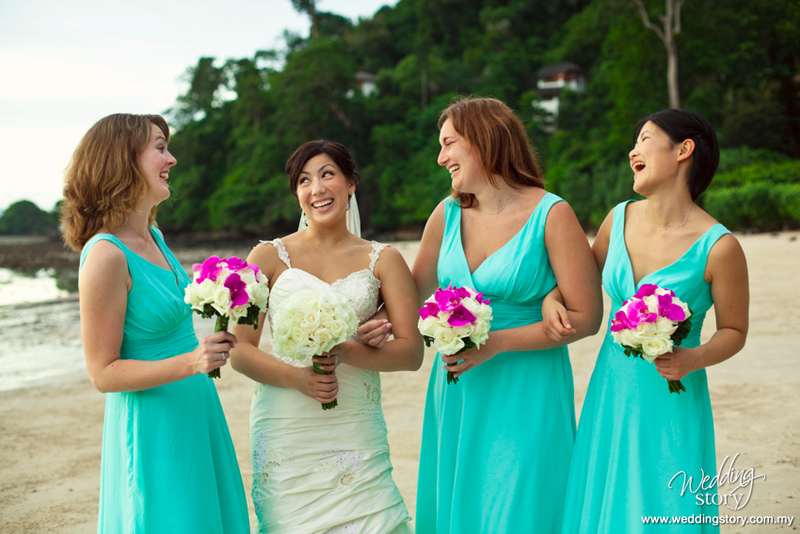 We’re so glad to be a part of your big day (not to mention be on the beach in Langkawi too!). Nice work ! Love the umbrella shot as well as the one next to it. wow, great shots… luv it! The bride is so beautiful and happy. Hey, absolutely stunning. Looks like a true fairytale wedding. Stuey boy, you’ve done well and I really missed out big time. I’m sure it was a blast. I look forward to meeting you Amy when I visit wherever you two may be. I hope your DNA is strong Amy cause if the kids come out looking like Stu, you’re screwed. Ahhhh Stuey how I miss the friendly banter mate ! A big congrats and I couldn’t be more envious of you both. What you have found is very difficult to find. You are blessed ! EVERY PERSONS OF FAMILY ARE WONDERFULL –ME TOO. THIS IS THE BEST DAY OF YOUR LIFE….. GOD BLESS YOU.. These are the most beautiful pictures I have seen. Thanks the photographer so anyone who couldn’t go to the wedding can imagine how the wedding was. Amy, you are so beautiful and your wedding also. I don’t know how much time you have put in to prepare for such a great wedding. 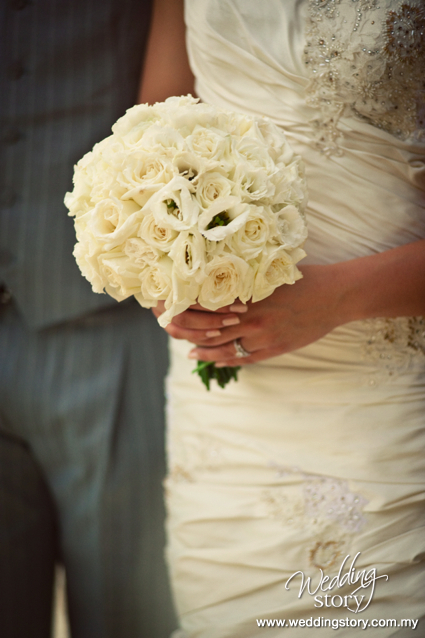 I love everything in your wedding. Now I’m so regretted that I couldn’t go. Congratulations again and hope to catch up with you someday. 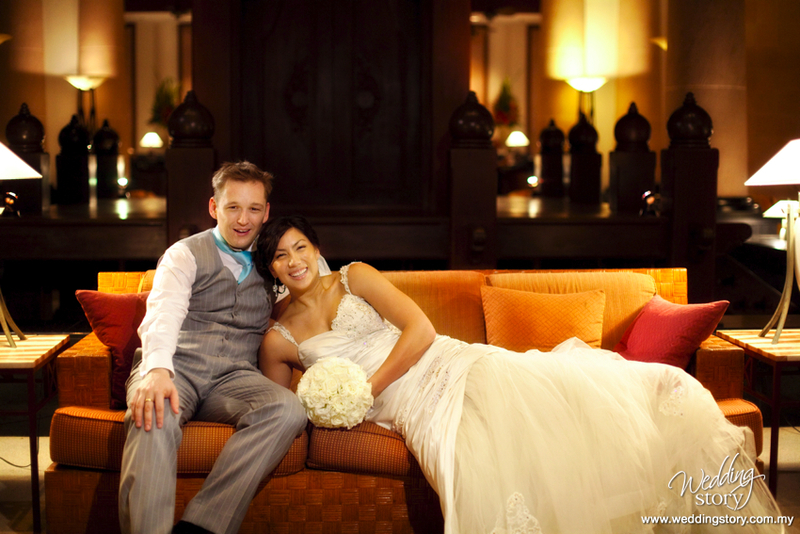 Amy you look beautiful, Stu looks pretty comfortable and the photos are lovely – your friends did you both proud as did the Andaman – it look a joyous occasion – congratulations! I LOVE THESE PICS SOOO SOOO SOOO MUCH!!! WISh i Can take the same as you GRACE!!! Your pics are an INSPIRATION to me!! Those are beautiful shots, cute and gorgeous – like you two. Brought back a lot of happy moments in Langkawi. Thanks so much for the wonderful comments. Brendan, keep on practicing and learning. Everyone starts somewhere. Learning is such an important part of our daily lives. 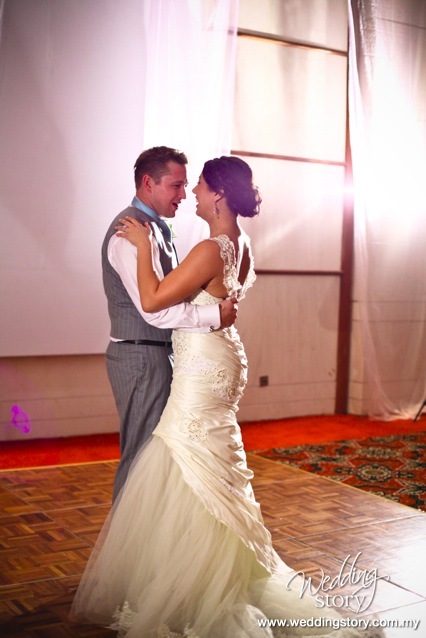 I have never seen such a happy bride – just breathtaking! Hi, I’m in the midst of planning my own wedding and ran across your site in a search. Lovely photos! 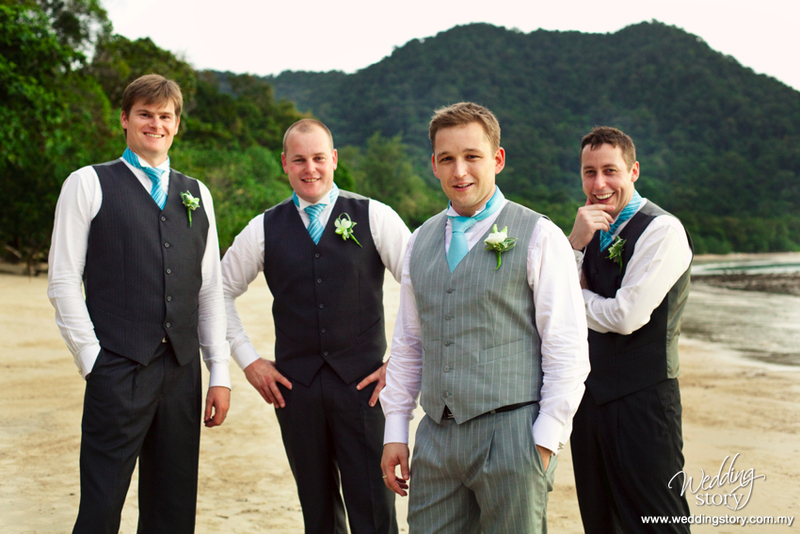 Any chance you remember what the groom and groomsmen are wearing (brand, style)? It’s exactly what we’re looking for. Would love a bit of help. Thanks so much. Hi Erin! Glad you stumbled upon our site. I am sorry but I can’t recall what brand the groom or groomsmen were wearing. All I remember was that it was a pretty expensive brand. :) Sorry can’t be of much help. wow! your photos are great. we are getting married at the Andman early next yr (2011). did you have many guests? did you have your dinner outside? i am wondering how big the poolside terrace is? 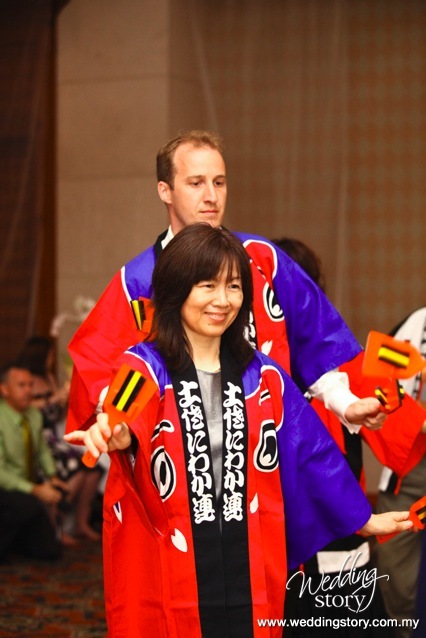 we have 35 guests, to sit and eat and also dance!? afterwards. will it be big enough? what time do they let you ‘party’ until? Thanks for visiting our site. I’m the photographer for Amy’s wedding. Am not sure if she’ll see your msg, but I’ll try to answer as much as I can! I think Amy had about 100+ guests I believe. The dinner was held indoors at one of the rooms in the Andaman. They partied till pass 12, I think! Am not too sure about the poolside terrace. Best to check with the hotel itself. Hope that helps! Sorry for a super late reply. In terms of the suits we had my hubby’s suit was made in Hong Kong however the groomsmens suits were made by Jack at PAGE Tailors – you can find him on level 1 Sungei Wang Plaza. Thanks to all my wonderful friends and family for the lovely comments. Hope to see you in person soon! Hi Alisha, Thanks for the comments! I’m Grace, the author for this blog post. We were the photographers for Amy’s wedding, and unfortunately, don’t know who did her nails! :) Congrats by the way, on your upcoming wedding? Are you still looking for a photographer?